Christoph Toepfer is CEO of Borealis Maritime, a company he founded in 2010 as an independent maritime investment and ship management firm. In July 2013, Borealis formed a joint-venture with KKR which today is backed by USD 400 million of equity capital. Since 2010 Borealis has realized investments in excess of USD 900 million and currently manages a portfolio of 68 vessels in the container, chemical and dry cargo sectors. In 2018, Borealis expanded its activities by forming Australis Maritime as a finance provider for maritime assets. For the commercial management of its container fleet, Borealis co-established Hanseatic Unity Chartering in 2015 which today commercially manages around 210 container and 30 dry bulk vessels from offices in Hamburg, Singapore and Cyprus. 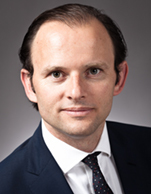 Prior to Borealis, Christoph was Managing Director of Allocean, a UK and Singapore based diversified shipping group with a fleet of 60 vessels. Christoph holds a Bachelor's degree from Syracuse University, New York, and a Master's degree from Cass Business School in London.